Concealer. If you get this right it can seriously look like you've been drinking from the fountain of youth. As Bobbi Brown puts it 'Concealer is the one product that, when chosen correctly, can instantly lift and brighten the face'. I never realised the need for under-eye concealer until I had my first child. It can add a good six hour's sleep to your face if applied correctly. Since discovering it, it has become the makeup staple that I apply religiously. In my trials I have dabbled in several products. I think this is an area where you really need to do your research as different formulas work differently on each individual skin type. It is so important to get colour matched correctly so head to your nearest makeup counter as buying online and guessing your colour is not a wise option. 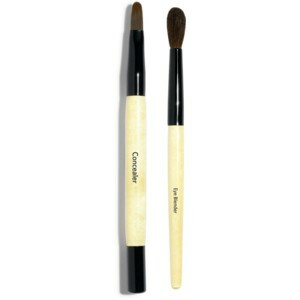 To apply concealer you need to use a synthetic concealer brush like this one, or if you are in Australia this one. I also think less is more when applying, so do it sparingly and pat it in to the skin with your ring finger. Powder sets concealer. You need to invest in some setting powder to lock the concealer in place as nothing looks worse than concealer sitting in the little lines around your eyes. This should be set with a fluffy brush like this one, or if you are in Australia this one. In my journey, the first concealer I bought was the Ellis Faas concealer in S203 and while it was a revelation having never worn it before, I found the consistency too runny for me and no matter how much setting powder was used, it constantly ran into my fine lines. Ellis Faas is available at Mecca Cosmetica in Australia. The next discovery was the Chantecaille Total Concealer in Camomile (as you know, I am quite the fan of this brand) and I find it is brilliant with a thicker consistency than the Ellis Faas. Once I add on my powder, this stays in place all day*. 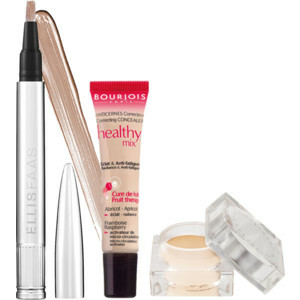 A cheap option that I am very impressed with is the Bourjois Healthy Mix concealer in shade 52. For the price, this is a goodie and it's available at Priceline in Australia. My latest splurge has been on the Bobbi Brown corrector in light to medium bisque along with the Bobbi Brown creamy concealer kit (the concealer shade I was matched to was cool sand). While I was hesitant to add in another step to my express regime, using the corrector first really does make a difference as you cancel out any unwanted shadows first, then apply concealer over the top. To be completely honest, so far I am not loving the consistency. It is heavier than I am used to so I will be playing around with this for a while longer to see if it suits my 'less is more' makeup style. I do however, love the portability of having the concealer and powder packaged together in a sleek little compact. Perfect for travel. As far at setting powders go, most brands do them. I am rather a fan of the Laura Mercier Secret Brightening Powder, or you can just keep things simple with a basic setting powder like the MAC Prep + Prime Transparent Finishing Powder. Be warned, loose powders do not travel well. I learnt that the hard way! Do you have any concealer tips and tricks or products I should know about? I am constantly on the hunt so feel free to share in the comments box. *I can't seem to find this on the Mecca Cosmetica website to link it in right now so i'm afraid it may be out of stock.